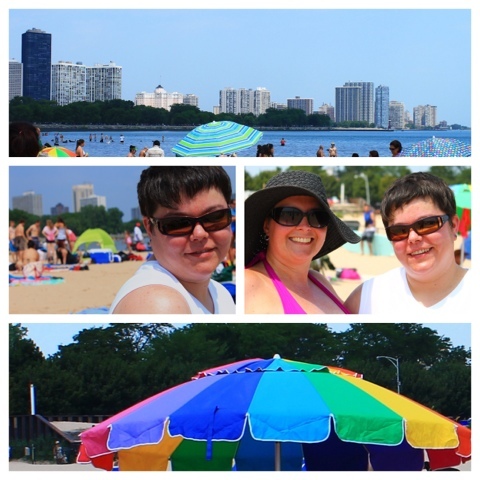 Yesterday we went to Montrose Beach in Chicago. We arrived before 9am to beat the crowd. No one goes to Montrose Beach unless you have dogs. WRONG! We pulled in to a full parking lot, thousands of people were already milling about. Tents, tables, chairs, grills, hammocks, kids, toys, old people propped in chairs against trees. Seriously, full apartments were set up in the grass. Radios blaring and the smell of carne asade already wafting through the air. My little eavesdropper was enjoying a family's conversation and quickly pointed out that "look, they're Italian too!". She gets Spanish and Italian confused. No mention of a bano though. As we waited for Aunt G, B and I took a walk to find the toilets. There were thousands (no exaggeration) of people all set up to spend the entire day and night here, yet, no toilets ANYWHERE. I let B in on a well known secret: if you have to pee, you pee in the lake. Disgusting, right? Well, thank you City of Chicago for no toilets. I know darn well that these off-the-gridders will have to use the facilities and if they didn't bring along a camping toilet, or plan on digging a hole, then guess what? To the lake they will go. We set up all our belongings: 3 blankets, a small cooler, a kid's chair and lathered on the SPF40. To the water we went. 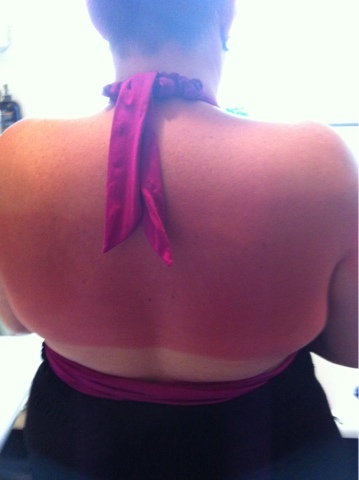 To the towel to roast in the sun I stayed for the most part. I'm not a fan of lakes. People pee in them. This was B's first beach experience. She stayed in the lake most of the visit. When the sun began making me sick, I quickly went in to the frigid water to stop my insides from cooking. While in there hanging with my baby she proudly screamed "I peed 2 times". Queue my gag reflex. After four fun, scorching hours we headed to the car. The sand was at least 2000 degrees. I wanted to cry it burned so bad. Warrior Dash has nothing on our 4th of July Beach Dash to Safety! 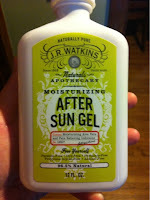 At home I slathered on the Watkins After Sun Gel. It was miraculous how quickly the stinging and burning stopped after I buttered myself up with it. OMG! The secret is the Lidocaine mixed with the Aloe. When we were all sting free to the basement kitchen we headed to make some pizzas! Yum. While enjoying our creations we played Pass the Pigs and Yahtzee. We want our 15 year old Godson to leave having a well rounded cultural experience. He felt out of sorts not having a video game controller in his hand. He got over it. By 11pm we were all pooped and headed to bed. Today we are scheduled to paint the house but it's another 100'er out there so we may just chill indoors and let our epidermis have a day off from extreme conditions.